Choose from three different styles of Low Vision Playing Cards: Cartamundi Low Vision Playing Cards, Bicycle EZ See Low Vision Playing Cards, and Copag Low Vision 100% Plastic Playing Cards. All our Low Vision, Easy Read Playing Cards with super large numbers are in stock for immediate shipment. 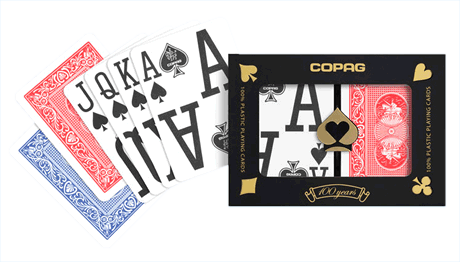 For more information or volume pricing on Cartamundi Low Vision Playing Cards, Bicycle EZ See Low Vision Playing Cards, and Copag Low Vision 100% Plastic Playing Cards, please contact us 1-800-233-0828. SALE! Now $6.95/Set. Save 30%! SALE! Now $6.00/Set. Save 40%!